Netflix streaming isn’t just a feature that is nice to have, for many people it is a must have for any video streaming software. Unfortunately it has been missing from XBMC for various reasons, until today. 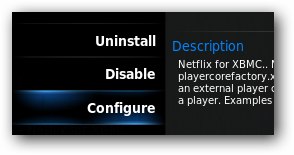 In order to get Netflix Watch Instantly working in XBMC you just need to have XBMC 10.0+ installed on Windows or OS X. Because of a lack of Silverlight support, this currently does not work on XBMC Live, Linux, or iOS devices (iPhone, iPad, AppleTV). You also need to live in a region that offers Netflix streaming (currently US and Canada). To install XBMC Flicks in the latest version of XBMC all you need to do is go into your settings then add-ons. Click on get add-ons -> XBMC.org add-ons -> video add-ons then scroll to the bottom of the list and click XBMC Flicks. Note: If you don’t see XBMC Flicks, you do not have a system that is capable of playing streaming Netflix or you are missing needed components. Click install on the following window and the add-on will be automatically downloaded and installed in your system. To change settings for the application click configure from the installation window. You may need to change the setting “Are you in Canada?” if you are using Netflix from Canada. This setting will automatically use the Netflix.ca website for streaming. If you are using OS X, change the “OSX” setting under miscellaneous to Yes. 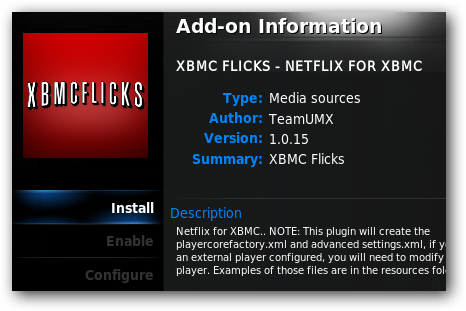 The next step is to authorize XBMC Flicks to connect to your Netflix account. If you are familiar with authorizing any other Netflix streamer this step will be very familiar to you. In XBMC go to videos -> video add-ons -> XBMC Flicks and you will be prompted to click OK after you finish authorizing the add-on. 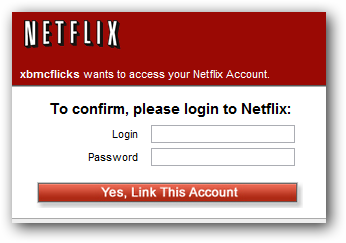 A browser window should automatically launch and go to the Netflix authorization page. Log in and click “Yes, Link This Account” and you will be forwarded to the confirmation page. Now close your browser and go back to XBMC and click OK. Restart XBMC and go back to the add-on. XBMC Flicks works like any other Netflix streaming application. You have access to browse your instant queue, top 25, new arrivals, or by genre. You can even search to jump right to a video whether or not it is in your instant queue. 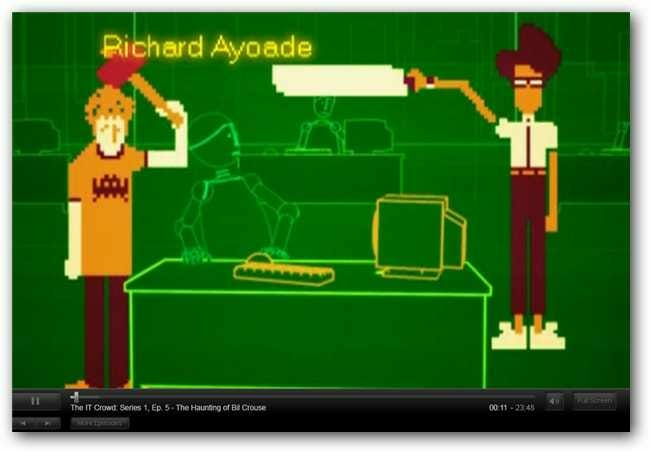 Once you find a video you want to watch, a full screen Netflix window will open and begin streaming your video. You will need to log into Netflix to begin playback so we would recommend having Netflix remember your login information for seamless playback. During playback a remote control will still work for play, pause, etc., but if you don’t have a remote you will need to push Alt+F4 in Windows or Command+Q in OS X to quit playback and go back to XBMC. For help and support with the add-on please see the official XBMC Flicks forum thread on XBMC.org.